dressed up like a lady: Happy Holidays! We painted our living room just in time to put up our tree and snap some Christmas card photos. This time last year, Cammila and I were in the final stretch of closing on our house, and the card I made for her envisioned us next year, finally relaxing, hopefully beneath the glow of a pink, tinsel Christmas tree -- which as you can see, we found! So far, despite and in some ways because of recent events in the world, our hearts are more full of gratitude than ever. Here's wishing love and happiness to all of you. P.S. Too true about the cowboy/cowgirl thing. So much fun! Love the pics :) Happy Holidays! i love it!! and it is my dream to someday have a pink tree!! Love the Christmas card! happy Holidays & wishing you all the best for 2013!! What a sweet post. How loving of you to envision a christmas scenario she would love, follow through and provide it for her, making fairy tales happen! 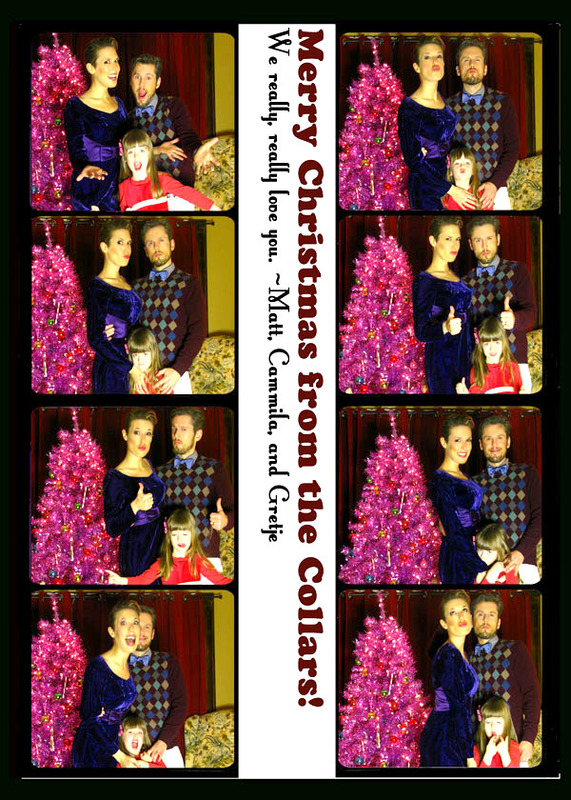 Happy Holidays to the cutest damn family around!